Will Granite Gate be ignored? 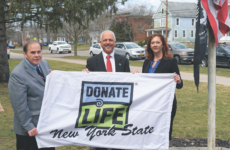 A case of apparent bid rigging at the New York State Office of Parks, Recreation and Historic Preservation, seems to have gone largely unnoticed. It occurred as part of Gov. 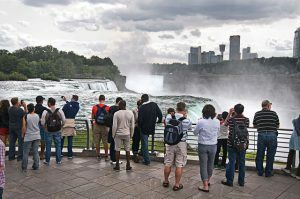 Andrew Cuomo’s $50 million Niagara Falls State Park Landscape Improvement plan. The genesis was 2012-13. The place was Saratoga Springs, near Albany. The players are a husband and wife, a father and daughter, and the taxpayers of New York State. The husband is Stephen McCorkell, a landscape architect and project manager for NY State Parks. His job is to select companies to design, plan and oversee state park improvements. Mr. McCorkle is paid $115,000 per year. He lives in Saratoga Springs. His wife, Lisa Tonnelson-McCorkell, is also a landscape architect. 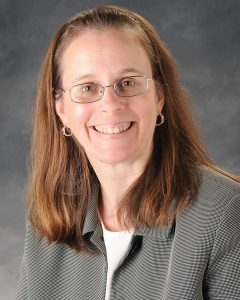 She works for the LA Group, of Saratoga Springs. The firm designs, plans and oversees park improvements for government agencies. 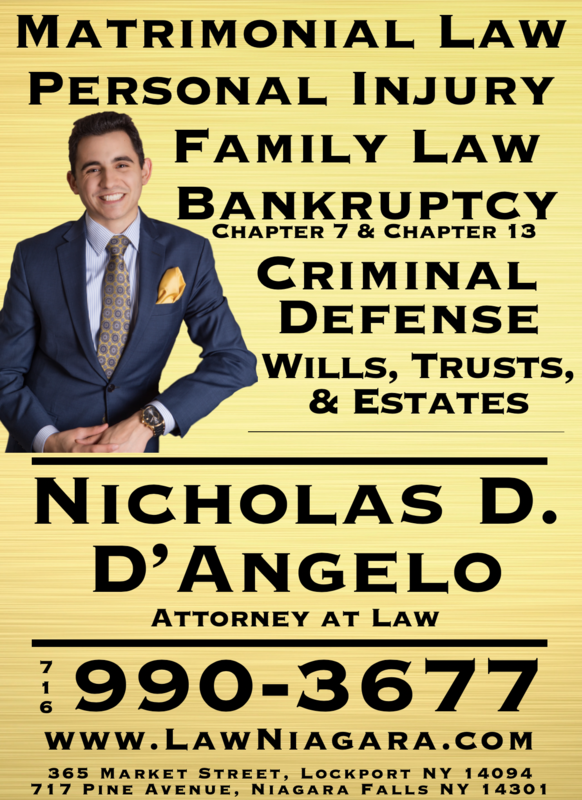 Mrs. McCorkell’s boss was S. Jeffrey Anthony, co-founder of The LA Group. He is the father of Kirsten Anthony. She worked for Champlain Stone, another Saratoga Company with quarries in the Adirondacks. She was responsible for making spec sheets which described the type of stone Champlain sold and she also handled marketing for the company. 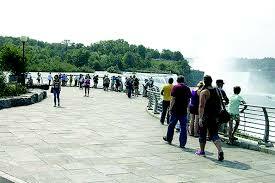 Mr. McCorkell was project manager for the Niagara Falls State Park improvement plan. 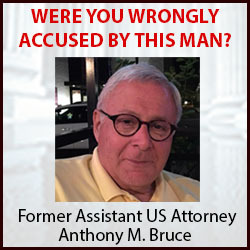 He sat on the committee that awarded a $4.5 million contract to the LA Group, the company where is wife works. 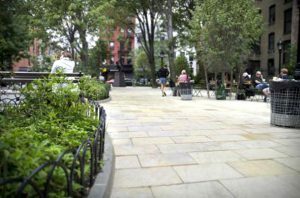 The plans called for new railings, landscaping, park benches, cutting down 100-year-old trees, and replacing them with pavement. The preliminary plans suggested the use of limestone pavers. 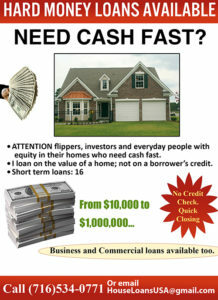 The cost can be as little as $5 per square foot. Limestone is cheap and available through vendors near the job site. The LA Group chose to use granite. This would raise the price of the work since granite might cost $20 per square foot. Although Uni-Lock offered concrete unity pavers that mimic granite, surpassing it in durability and strength, that cost $10 per square foot. 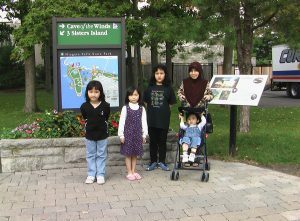 The LA Group designed plans specifying the color and type of granite that they wanted used in the park. This granite had a name. It was called ”Corinthian Granite”. 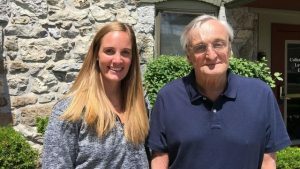 There was only place in the world where it could be purchased – at a quarry in the Adirondacks, owned by Champlain Stone, where Kirsten Anthony, the daughter of LA Group’s owner, Jeffrey Anthony. Since there was only one place where it could be purchased, Champlain Stone could name their own price. The company chose to sell Corinthian Granite at $60 per square foot. All the contractors who bid on the job knew in advance, from looking at the specs, that granite had to be purchased from Champlain Stone. Contractors bid jobs factoring in their cost of $60 per square foot for granite from Champlain Stone. Acres of the expensive, peculiar-colored granite was used by contractors all over the park, including Prospect Point, and the Plaza Area at the Cave of the Winds on Goat Island. The low bid, for example, for the Prospect Point section, was approximately $4 million. The winning bidder was Scott Lawn Yard. 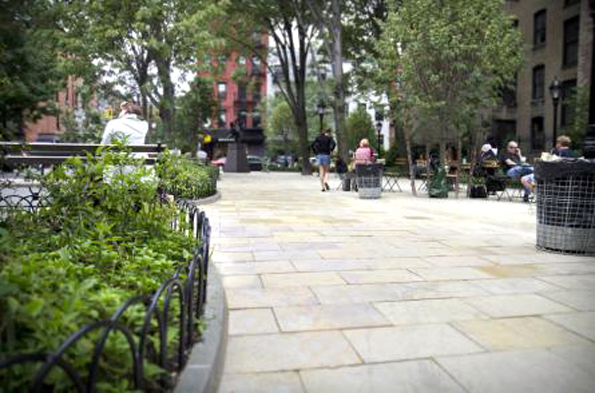 More than $1 million worth of Corinthian Granite pavers were needed. The extra cost of the Corinthian granite may have jacked up the price by as much as $600,000. “Someone is getting a free cottage on the lake for this one” said a contractor at the time. The Champlain Stone granite proved to be a disaster. Parks workers say a worse choice could not have been made. 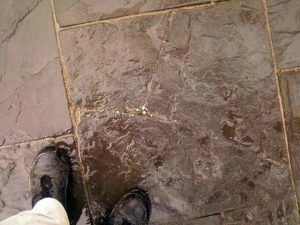 Corinthian granite has a glossy, glasslike surface that is slippery when wet and it is often wet due to mist from Niagara Falls. People everywhere would slip and fall. 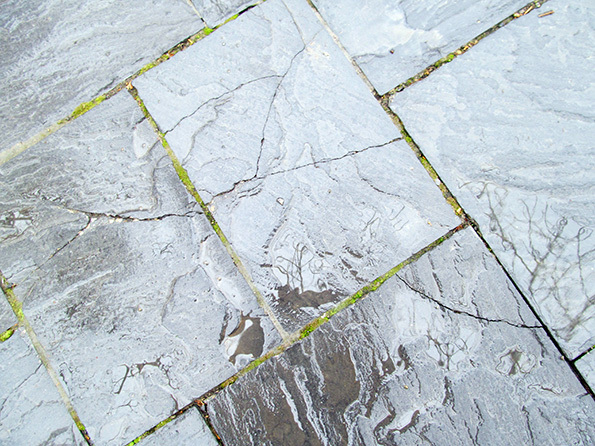 Limestone found in natural rock formations in and around Niagara Falls, makes an excellent paver. Limestone is porous and rough textured, making it slip resistant. Above is a recent photo of cracked Corinthian granite at the Niagara Falls State Park. Granite also cracks easily. 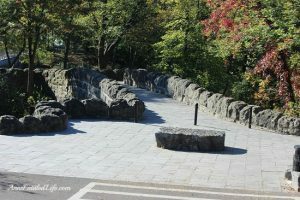 The granite pavers have been in place a few years. 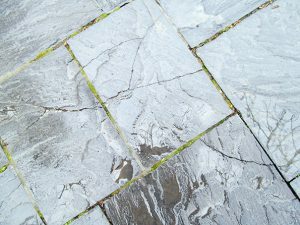 Throughout the park there are many cracked granite pavers. More are cracking every day. What they will look like 20 years from now? 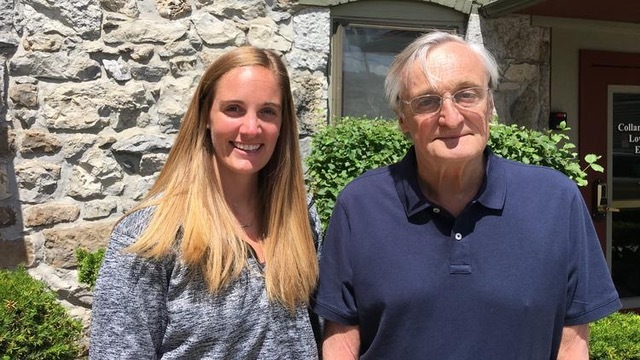 Shortly after the work was completed in Niagara Falls, Mr. Anthony retired from The LA Group and co-founded with his daughter Kirsten, Studio A Landscape Design in Saratoga Springs. Mrs. Tonnesson-McCorkle was promoted to partner at the LA Group. 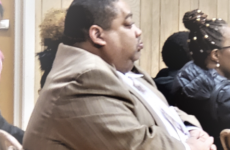 Mr. McCorkle got several raises at State Parks where he continues to get his wife’s company work. 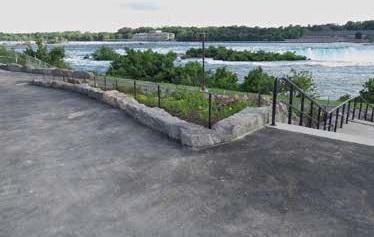 The LA Group won the Built Design Merit Award from the New York Upstate Chapter of the American Society of Landscape Architects for its design work at Terrapin Point Reconstruction Project at Niagara Falls State Park. Ironically, Terrapin Point was one of the few locales in the state park where they did not use Champlain stone granite. They used concrete, slip resistant and much less expensive Unilock. A husband at State Parks selects the design company where his wife works. That company designs plans where pavers must be purchased from the company where the owner’s daughter works. In New York State, if you are well connected, you can pave the road to heaven with bad intentions. Mr. McClorkle declined to comment for this story referring the Reporter to the Public Relations Dept. of the NY State Parks. A spokesman for the LA Group declined to comment for this story. While the waterfalls are beautiful, did you ever wonder why there is so many new pavers in the Niagara Falls State Park? How do you blow through $50 million on a state park that really has only about 50 acres of land? Pavers and designers, that’s the ticket. Mr. McCorkell declined to comment for this story referring the Reporter to the Public Relations Dept. of the NY State Parks. A spokesman for the LA Group declined to comment for this story. Can the State request a Rebate for being overcharged on the Corinthian Granite given its poor quality when exposed to mist and water ? 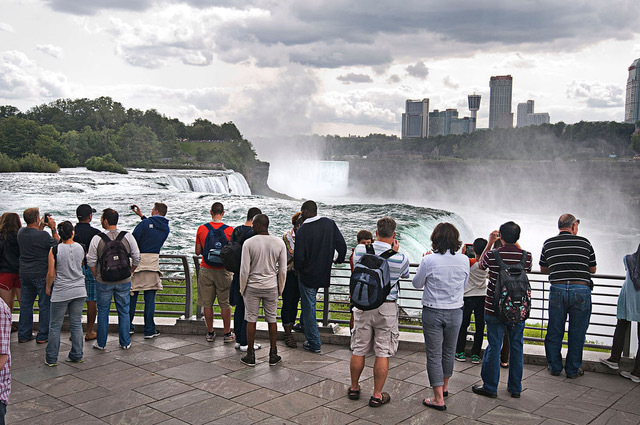 only here at niagara falls, a wonder of the world ,where they should be buying up property to make parking lots, because of all the businesses that are near falls and no place to park. no they blow it en granite tile to be put near the water thats makes it become a skating rink. oh wait there are no businesses that are coming there so they don’t need parking, just fix the roads to the bridge so its a smooth ride to canada . way to go!!!!!!!!!!!! But the state doesn’t even keep the grass cut of weed the flower beds! I was very disappointed about the state of the grounds in July and August while visiting! Such natural attractions are just a godsend for the development of tourism for every country, as it brings a lot of benefits. Howdy! Someone in my Facebook group shared this website with us so I came to look it over. I’m definitely enjoying the information. I’m book-marking and will be tweeting this to my followers! Terrific blog and fantastic design and style. g8EQcx Thanks for sharing, this is a fantastic blog article.Thanks Again. Really Great. I’m impressed, I must say. Seriously hardly ever do I encounter a weblog that’s both educative and entertaining, and let me tell you, you’ve hit the nail on the head. Your notion is outstanding; the issue is some thing that not enough people today are speaking intelligently about. I’m very happy that I stumbled across this in my search for some thing relating to this. As it is designed for use while you are awake, the husband pillow must be comfortable yet supportive; solid yet not unwieldy. Some designs take comfort to a whole new level!